Whether carbureted or injected, the fuel system is designed to provide the optimum mixture of air and fuel to the engine under varying conditions. This optimum air/fuel ratio (do not call it the fuel/air ratio!) is called the stoichiometric ratio and in theory is approximately 14.7 parts of air to 1 part gasoline (14.7:1) based on weight, not volume. However, this air/fuel ratio must be modified under different atmospheric and running conditions. A ratio numerically higher than 14.7 would be considered a lean air/fuel mixture, numerically less than 14.7 would be considered a rich mixture. There are three basic types of carburetors: fixed venturi, mechanical slide and constant velocity (CV). Despite their differences, they all use the Venturi Principle, which states that air flowing through a restriction will increase in speed and decrease in pressure. It is the decrease in pressure in the carburetor venturi that allows atmospheric pressure to push fuel into the venturi through passageways that are machined into the carburetor body. These passageways contain jets that control the amount of fuel flow through them. In order to burn properly and efficiently, the fuel must be first atomized (broken down into a fine mist) and then vaporized, that is, changed from a liquid to a vapor. When the air/fuel mist enters the combustion chamber, engine heat helps vaporize the fuel. However, when the engine is cold the fuel does not vaporize as completely, so we must supply more fuel so that enough of it is vaporized for the engine to run. This is the purpose of the cold start mechanism (commonly called the choke) used on carbureted engines. There are currently two type of cold start mechanisms used in carburetors, the choke plate and the enrichener. The choke plate pivots to block off some of the incoming air, while the enrichener adds more fuel. Both methods result in the same condition—a rich mixture in the neighborhood of 3:1. A fuel injection system does this by automatically increasing injector duration, which is how long the injector sprays fuel into the combustion chamber. The longer the injector duration, the more fuel is sprayed into the engine and the richer the mixture. 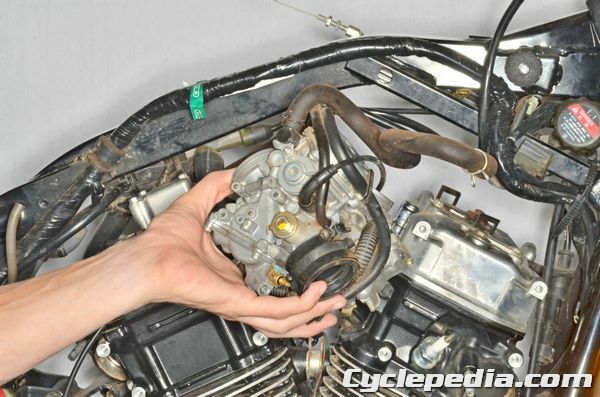 Running a carbureted engine that is at or close to operating temperature with the cold start mechanism on will result in a rich mixture when it isn’t needed and can result in fouled spark plugs. Carburetors are mechanical/hydraulic/pneumatic devices that have several functions. They allow us to change engine speed by allowing more or less air/fuel mixture to enter the engine, they help atomize the fuel for better vaporization, and they provide varying air/fuel ratios under different throttle positions. For an engine at operating temperature, there are three basic fuel circuits. Also known as the idle circuit or the slow speed circuit, it controls the air/fuel mixture while the engine is idling and up to about 1/8 throttle opening (it also flows fuel at larger throttle openings but the effect is negligible). Because of the small amount of fuel that is required at idle speeds, the pilot fuel passageway is restricted by the pilot jet. Carburetor jets (of any type) are usually made out of brass and come in different sizes. A number is stamped on the jet during manufacturing, the larger the number the larger the opening in the pilot jet and the richer the mixture would be. Because of the very small size of the opening in a pilot jet, is can easily be blocked by dirt, rust, stale fuel deposits or other debris. When this happens, the engine will not idle properly and the carburetor(s) will have to be removed, disassembled and cleaned. As we open the throttle to accelerate, the carburetor allows more air to enter the engine, and there must be a corresponding increase in the amount of fuel flow. In most cases, this is accomplished by the use of a slide and jet needle, whether it is a mechanically operated slide or a vacuum operated slide. The jet needle raises and lowers with the slide and fits into a brass tube called the needle jet. Do not get confused between the two, the jet needle moves up and down while the needle jet is stationary in the body of the carburetor. The jet needle is tapered so that as it is raised in the needle jet, there is more space between the two and more fuel is allowed to flow. This circuit regulates the air/fuel mixture primarily from 1/8 throttle to about 3/4 throttle. As the throttle is opened approaching full throttle, the carburetor allows even more air to enter the engine and the main jet now controls the amount of fuel that is supplied. As with the pilot jet, it is usually made of brass, comes in different sizes and has a number stamped on it. Again, the larger the number, the larger the opening and the more fuel is supplied for a richer mixture. Larger main jets are often required with changes to the intake and exhaust of the engine. The opening in a main jet is much larger than a pilot jet and is less likely to be blocked or restricted. 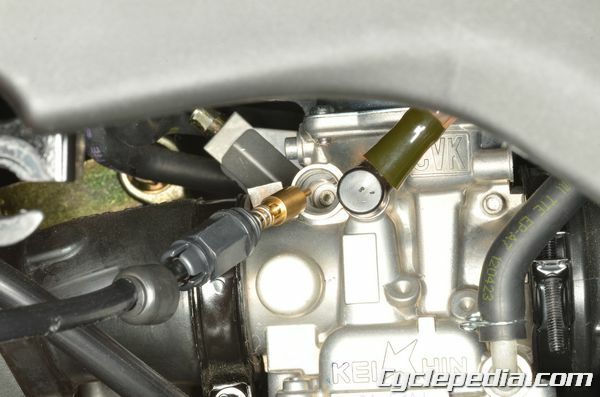 This circuit regulates the air/fuel mixture primarily from 3/4 throttle to wide open throttle.